Gaze on her face. And know that this was the first women ever contemporaneously recorded as being buried in red silk stockings. 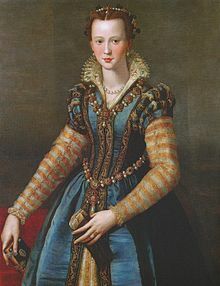 Born in 1522, she was a woman of formidable intellect: trusted by her Medici husband to run his affairs in Tuscany when he travelled. 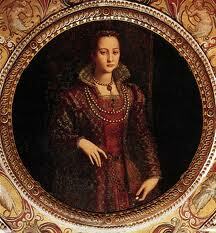 Eleanor of Toledo, a Salamancan, has been fabled by some as the first ever formal First Lady. A fiercely loyal wife, she also put on the perfect show of luxury. Her dresses were always meticulously stylish and lavish; indeed, she employed 10 gold and silver weavers to work on her clothes at any one time. Oh, my dear, the dresses. But it was her red stockings which may have bested Elizabeth I. For many years it was thought that Elizabeth was the first woman to wear silk stockings after her silkwoman, Mistress Alice Montague, made a black silk pair which put all other linen stockings in the shade. 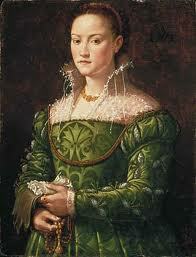 And from that time on – around 1560 – she would wear nothing else, it is said. But contemporaneous records of Eleanor’s burial, after she and her sons died of malaria in 1562, record she was buried in the crimson stockings she wore in life. So the prize for the first silk stockings hovers between two iron ladies. But they have been a luxury, dividing rich from poor, since Elizabeth’s sumptuary laws. She died in 1603: and around 150 years later, the difference between a luxury and a rough everyday stocking was still plain for all to see. And it gave rise to a label both prized and despised. It was Yorkshire woman Elizabeth Montague, wealthy and pragmatic, who began to gather about her a society of clever people, including Dr Johnson and such elevated personalities. They discussed iterature and art over tea and biscuits. And she chose to include both the great men of the day- and the great women. Black silk stockings were for formal wear; blue worsted were for rough daily use. Benjamin Stillingsfleet -author, botanist and translator – had given up society, and had no evening clothes to wear for Mrs Montague’s gatherings. Oh, not to worry, Mrs Montague said: Come in your blue stockings. And a brand was born. Appearance played second fiddle to intellect in The Bluestocking Club. Yet both of these were trumped by gender. The accomplished women in the bluestocking ranks supported each other intellectually.The Oxford National Dictionary of Biography records Elizabeth as giving as good as she got: “In a woman’s education, little but outward accomplishment is regarded ,” she said. Who could have guessed the stocking could be so divisive? From crimson to black to blue, all made a statement greater than their diminutive size in the wardrobe. A small, but very telling, coda. After the death of Elizabeth I’s father, Henry VIII, his wardrobe was itemised and recorded methodically. And in the inventory, clear as day, are recorded several pairs of silk stockings. 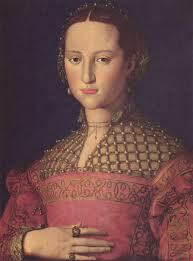 With thanks to The Purple Files for a fabulously researched article on the Renaissance stocking. Anna Laetitia Barbauld, James Beattie, Frances Boscawen, Henrietta Maria Bowdler, Edmund Burke, Frances Burney, Elizabeth Carter, Margaret Cavendish-Harley, Hester Chapone, Mary Delaney,Sarah Fielding, David Garrick, Samuel Johnson,Ada Lovelace, Catharine Macaulay, Elizabeth Montagu Hannah More, William Pulteney, 1st Earl of Bath, Clara Reeve, Sarah Scott, Sir Joshua Reynolds, Catherine Talbot, Hester Thrale, Elizabeth Vesey, Horace Walpole, and Anna Williams were all part of the Bluestocking circle at one time or another. Posted in Quirks of HistoryTagged anglophile, bluestocking, Elizabeth I, england, Henry VIII, history, silk stockingsBookmark the permalink. A colorful post. Interesting history. Where do you dig for these interesting facts? 🙂 very intriguing. I got to thinking about the term ‘bluestocking’, Jas, and it snowballed from there…. I couldn’t find anything that looked like minutes, Kathy, but that doesn’t mean there aren’t any…I can almost hear you in the scramble for Life Of Johnson 😀 Let us all know what you find!! The paintings of Eleanor of Toledo are wonderful. The intensity of colour and expression are breathtaking. This is a genre of painting that I find mesmeric. Thanks for a fantastic post on every front, Kate. I’ve filed this one away. Pleasure, Roger. I’d give anything for one of those frocks. As you observed, Kate, those dresses are stunning. I can appreciate each and every stitch that is portrayed. The metals would have been pure – that is pure gold and pure silver. The cost unimagineable today, it would be in the millions – and just for one dress…. I thought this might be just up your street, Myfanwy 🙂 And like you, I have always considered my stockings just a little blue. Fascinating, Kate. I knew the term from Heyer novels, but not the origin. Not me, 48 hours ago 🙂 I love this blogging lark. Aren’t they? Mind you, you have some gorgeous frocks of your own, Fiona. Another case of history brought to life for us, thanks for sharing, especially the gorgeous dresses. Pleasure, Lou.Life is full of stories, isn’t it? Amazing how rayon in the 60’s changed the silk and ‘other’ divide for the casual observer. The textile revolution, Sidey: democracy in beige nylon form. Quite, Karen 😀 And you’ve heard how they made them look more realistic here? With gravy browning? I had no idea the Bluestockings originally was a term for mixed company! And I think perhaps, if I were to buried at all, I should like it to be in scarlet silk stockings. Much like that Medici madonna all those years ago, Cameron. Stories, stories, stories: they’re everywhere, aren’t they? 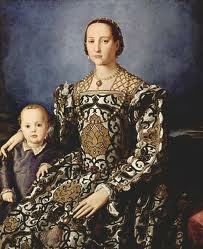 The image of Eleanor with a child looks familiar: is it in the Uffizi perhaps or the Pitti Palace? Another great article! Hooray, got something right today! Thanks for the link, too. 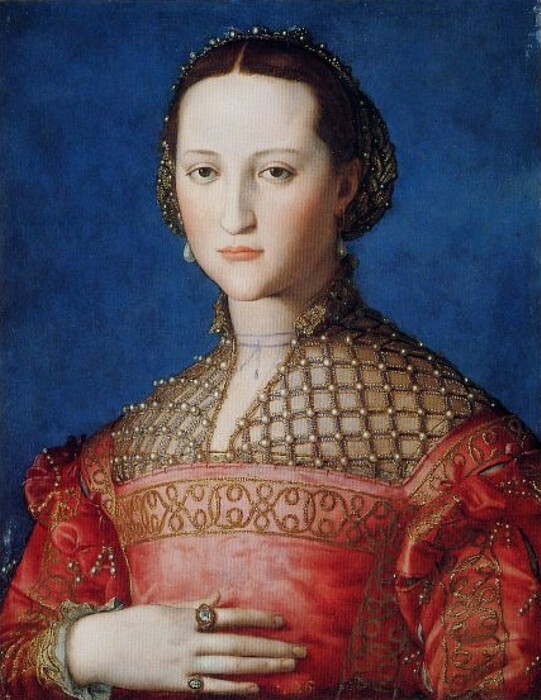 Bronzino is such a reliable portraitist in terms of control, colour, tone and detail, but it sounds as if he was happy to flatter his sitters when they were wealthy patrons. I thought that “bluestocking” was a term somehow related more feminism, but until I read your post, Kate, I was otherwise ignorant of what it exactly meant. Then again, I wear socks. Me too, Lame. Looks a great shop. When I came to NY I stayed at the Algonquin: the scene of the Round Table crew. Including my heroine, Dorothy Parker. There are groups like this all over: thank goodness. I love those 18th century cartoons, Kate. I always pore over them when I see them, looking for the layers in the artwork. There’s always a main message, but like your psalter the other day, there are usually a lot of hidden gems. There are, Andra. What we really need is a huge canvas-sized version to put on the wall and peruse. Eleanor was a beauty! I’ve heard of the Blue Stockings but had little understanding of the reference. I do love the Hazlitt quote. Wow! He didn’t hold back! No, Debra: and nor, I notice, did Elizabeth…. Ah, Bess, what a tough old bird 🙂 She must have been magnetic, working her way through-was it four husbands? Still, because of her skill and power we have Chatsworth…quite a legacy. The portraits of Eleanor are stunning. I wonder if her clothes were heavy. I bet they were, with all that precious metal and probably layers of petticoats and so forth. At that time, I suppose great ladies had to bear up to ninety-pound dresses with cool hauteur. I’ve heard the term “blue stocking” from time to time, and always associated it with an intellectual woman, usually an “old maid” with spectacles. I’m trying to remember if Scarlett O’Hara labeled Melanie Wilkes a blue stocking. Clever, Gale 🙂 Great angle. Thank you, Lexy. Without this vast internet it would not be possible. Perhaps intellectualism in women was thought undiginifed and portrayed as such, Nancy? I never really knew what the term “bluestocking” meant, Kate, and now I do. Such a lively post and the second one about stockings I read tonight. Ah, stockings must be in the ether, Penny…. I love the blue stocking club concept! Me too, Tandy. I would have liked to be a member. What interesting information! 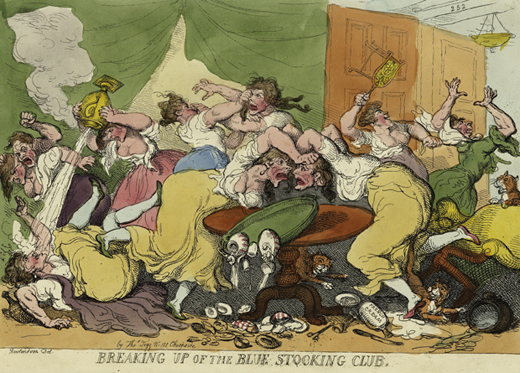 I like the idea of the blue-stocking club. I had read the phrase, but did not know it’s history. I think it must have been a breath of fresh air for its members, Banno…. Loved this post Kate and love those paintings but I must confess that I’ve never heard the term “bluestocking” Wherever have I been? Now you have me pondering what color of stockings I will be wearing next week and what the meaning is behind them? Is there any facts about patterned stockings? I have used the term, but I think only approximately in the right context, after reading this!